The Clemson Tigers, known traditionally as the "Clemson University Fighting Tigers,” represent Clemson University in the sport of American football. The Tigers compete in the Football Bowl Subdivision (FBS) of the National Collegiate Athletic Association (NCAA) and the Atlantic Division of the Atlantic Coast Conference (ACC). Consistently ranked among the most elite college football programs in the United States, the team is known for its storied history, distinctive helmet, fight song and colors as well as the many traditions associated with the school. Formed in 1896, the program has over 700 wins and has achieved three consensus Division I Football National Championships in the modern era, and were College Football Playoff National Championship Finalists in 2015, 2016, and 2018, winning the championship game over the Alabama Crimson Tide for the 2016 and 2018 seasons. Clemson has had 6 undefeated seasons, 4 consecutive College Football Playoff appearances, 24 conference championships, 7 divisional titles, and has produced over 100 All-Americans, 17 Academic All-Americans and over 200 NFL players. Clemson has had seven members inducted into the College Football Hall of Fame including former players Banks McFadden, Terry Kinard, Jeff Davis, and former coaches John Heisman, Jess Neely, Frank Howard, and Danny Ford. Walter Merritt Riggs can be characterized as the "Father of Clemson Football", as he brought the game with him from Agricultural and Mechanical College of Alabama (now Auburn University). The fact that Auburn and Clemson share the same mascot is no accident. Riggs allowed his players to pick the team mascot and, although he may have influenced their decision, the players chose Tigers because Princeton University had just won the national championship. Riggs helped organize and coach the infant Tiger team in 1896. With little money to spend on uniforms, Riggs brought some of Auburn's old practice uniforms with him, which happened to have orange and navy jerseys. Because the jerseys had gone through a few washboard scrubbings, they were quite faded, the navy worse than the orange. So Riggs made the school's predominant color orange and the faded condition of the navy became the purplish color, officially known today as Regalia. The team played as a member of the Southern Intercollegiate Athletic Association (SIAA), the first southern athletics conference. The 1896 Clemson Tigers team. When the Tigers traveled to Greenville on Halloween to play Furman in their very first match, only Coach Riggs and backfield player Frank Thompkins had ever seen a football game played. Today in Clemson, the soccer field is named Historic Riggs field after Walter Riggs. Riggs took the team to a 2–1 record in the inaugural year. He then stepped aside at the urging of the military cadets/students, who felt that he should concentrate on his scholastic duties rather than coach the team for free. William M. Williams coached the Tigers in 1897, guiding them to a 2–2 record. The team beat South Carolina for the first time and was state champion. In 1898, John Penton led the Tigers to a 3–1 record. In 1899, when the Clemson Athletic Association could not afford a coaching salary, Riggs again took over the reins, one of only two Clemson football coaches to return to the position after stepping down. The 1899 squad went 4–2. Riggs' overall record of 6–3 gives him a .667 winning percentage. After decade as a Mechanical Engineering professor, he was named acting president of Clemson Agricultural College in 1910, being confirmed by the Board of Trustees as permanent president on March 7, 1911. He served until his untimely death on January 22, 1924 while on a trip to Washington, D.C. to meet with officials of other land grant institutions. 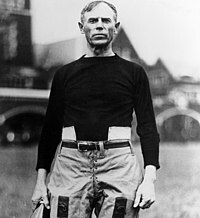 Riggs hired John Heisman to coach Clemson. Heisman stayed only four years at Clemson, where he compiled a record of 19–3–2, an .833 percentage, the best in Clemson football history. In four seasons, he had two SIAA titles. In his first season of 1900, he coached the Tigers to their first undefeated season (6–0), and first conference championship, outscoring their opponents 222–10 – the 64–0 win over Davidson on opening day was then the largest score ever made in the South. The season had various other "firsts", including the school's first defeat of the Georgia Bulldogs and the Alabama Crimson Tide. The only close game was with the South Atlantic school VPI. The 1902 team again won the SIAA. This was the first season with both Hope Sadler and Carl Sitton at ends. One writer recalls, "Sitton and Hope Sadler were the finest ends that Clemson ever had perhaps." The only loss on the year was the first to rival South Carolina since 1896. "The Carolina fans that week were carrying around a poster with the image of a tiger with a gamecock standing on top of it, holding the tiger's tail as if he was steering the tiger by the tail," Jay McCormick said. "Naturally, the Clemson guys didn't take too kindly to that, and on Wednesday and again on Thursday, there were sporadic fistfights involving brass knuckles and other objects and so forth, some of which resulted, according to the newspapers, in blood being spilled and persons having to seek medical assistance. After the game on Thursday, the Clemson guys frankly told the Carolina students that if you bring this poster, which is insulting to us, to the big parade on Friday, you're going to be in trouble. And naturally, of course, the Carolina students brought the poster to the parade. If you give someone an ultimatum and they're your rival, they're going to do exactly what you told them not to do." The 1903 team may have been Heisman's best at Clemson. Following a 73–0 defeat of Georgia Tech in 1903, the Yellow Jackets hired Heisman as their first full-time football coach. Fullback Jock Hanvey rushed for 104 yards in the first half. The account in the Atlanta Constitution read "Hanvey, the Clemson full back, outclassed them all. Time and time again he was sent through the line for gains of 10, 15 and 20 yards, and his tackles were spectacular." After the 1903 season, Clemson tied 11–11 in a game billed as the "SIAA Championship Game." Cumberland rushed out to an early 11 to 0 lead, but Clemson came back to tie. On the second half kickoff, Clemson quarterback John Maxwell raced 100 yards for a touchdown. Clemson missed the try. Later, Cumberland fumbled a punt and Clemson recovered. Cumberland expected a trick play when Fritz Furtick simply ran up the middle and scored. Eddie Cochems, a future innovator of the former pass, had just lost out to Phil King for the Wisconsin job, when he accepted to coach Clemson's 1905 team, which lost to Vanderbilt and Georgia Tech, but shut out Georgia, Alabama, and Auburn, featured stars left over from Heisman like Furtick and Puss Derrick. Bob Williams, who beat Heisman in 1902, came to Clemson in 1906, and also coached the 1909 and 1913–1915 teams. 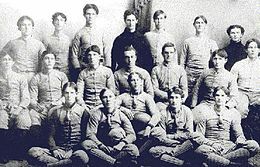 The Tigers went undefeated with a 4–0–3 record in 1906, with wins over Georgia, Auburn, Tennessee, and the John Heisman-coached Georgia Tech team. Clemson's first forward pass took place during the game with Tech in Atlanta. Left End Powell Lykes, dropped back to kick, but lobbed a 30-yard pass to George Warren instead. Clemson won, 10–0. The 1909 USC-Clemson was the first game broadcast in the state, by the United Wireless Telegraph Company. William Schilletter starred in 1913 and 1914, and was the son of Augustus "Shorty" Schilletter, a German immigrant in charge of the Clemson College dining hall. Frank Shaughnessy led the 1907 team to a. 4–4 record. Captain Mac McLaurin and R. T. Gaston starred at either tackle position. Vanderbilt legend Stein Stone posted just a 1–6 record in 1908. Captain Sticker Coles was All-Southern. Frank Dobson posted 11–12–1 overall record from 1910–1912. Wayne Hart had a 3–6 record in 1916. Washington & Lee's Edward Donahue coached the Tigers to 21–12–3 record over three seasons, from 1917–1920. Stumpy Banks scored five touchdowns against Furman in 1917 for a school record. Yen Lightsey starred in 1919 and 1920. Doc Stewart coached the Tigers through the transition from the SIAA to the Southern Conference, with a 6–10–2 record from 1921–1922. Bud Saunders led the Tigers to a 10–22–1 record from 1923–1926. Josh Cody coached the Tigers from 1927 to 1930, posting a 29–11–1 record. The Tigers were undefeated at home (13–0–1) and against South Carolina (3–0) during Cody's tenure. In 1927 Cody gave Red Sanders his first coaching job as backfield coach. O. K. Pressley made third-team All-American in 1928. "A better center than Captain O.K. Pressley of Clemson is hard to find," remarked former South Carolina head coach Billy Laval. In May 1929, when rumors were swirling that he might leave to coach a bigger-name program, the students, faculty, and staff took up a collection to buy him a brand new black Buick automobile. Raymond Johnson wrote upon Cody's death: "Josh Cody wanted to be Vanderbilt's coach so bad that he gave up the head man's job at Clemson College after four successful seasons." In 1931, Jess Neely (another McGugin product, and a former head coach at Rhodes and assistant at Alabama) became Clemson's head football coach. During his tenure, Neely led the Tigers to a 43–35–7 record. His final season at Clemson was the turning point in the Tigers' program. His team went 9–1 during that season, finishing second to Duke in the Southern Conference. The Tigers also received their first bowl invitation and bowl victory that year, defeating nationally ranked Boston College 6–3 in the 1940 Cotton Bowl Classic. The 1939 Tigers finished with a #12 ranking in the final AP poll. Clemson also had their first Associated Press All-American that year in Banks McFadden. Jess Neely, along with then athletic director Rupert Fike, founded the IPTAY Scholarship Fund, which supports the Clemson Athletic Department. An acronym for "I Pay Ten A Year," as that was what it asked boosters to donate when founded in 1934, IPTAY has since grown into one of the largest and most comprehensive collegiate sporting funds in the nation and a model for other programs. After Jess Neely left to become the head coach at Rice, Frank Howard (an assistant coach under Neely) was named head coach. Known for his colorful persona, and penchant for imaginative language with both probable, and improbable stories, in his 30 years at Clemson, Howard compiled a 165–118–12 record, a 3–3 bowl record, won two Southern Conference championships, and six ACC championships. Seven of Howard's teams finished the year ranked in at least one final poll. During his stay at Clemson, Howard also oversaw the athletic department, ticket sales, and was an assistant coach for the baseball team. He also incorporated the Single Wing, T-formation, and I-formation offenses at different points during his coaching career at Clemson. Clemson had two undefeated season under Howard, one in 1948 (11–0), and one in 1950 (9–0–1). As a line tutor and coach, Howard was part of Clemson's successful 1939 season under Neely, achieving an 8–1 record and a bid to the 1940 Cotton Bowl in Dallas to play undefeated Boston College. When Neely left Clemson in 1940, the Clemson Athletic Council met to name a successor and council member Prof. Sam Rhodes suggested Howard's name. Howard, standing in the back of the room, said "I second the nomination." He got the job, becoming Clemson's seventeenth head football coach and never left. He signed a one-year contract that he promptly lost, and he never had another in thirty years. Although Clemson was still a small military college until 1957, under Frank Howard's command, the Tigers remained nationally recognized contenders throughout the 1950s. In the sterling 1948 season, the team won a Southern Conference championship (Howard's first of eight). The Tiger's also won their second bowl game, a 1948 Gator Bowl win over Missouri, and finished eleventh in the national rankings. For the rest of his life, Howard credited the 1948 team with saving his job. Howard nearly repeated the 1948 success in 1950 when the Tigers were ranked tenth by the Associated Press with a 9–0–1 season and a 15–14 win over Miami (Florida) in Clemson's first Orange Bowl win. Under Howard's guidance, the Tigers were thus, champions on their first three bowl ventures. In January 1952, after a 7–2 regular season campaign, the Tiger's were invited back to the Gator Bowl, and by being conference champions once again in 1956, Clemson played in the 1957 Orange Bowl. In their second Gator Bowl trip, Miami downed Clemson 14–0; Colorado led Clemson 20–0, then trailed 21–20, in a comeback game, before finally defeating the Tigers 27–21 in Clemson's second Orange Bowl appearance. Two season's later, after an 8–3 season, the Tigers played in the 1959 Sugar Bowl and with their tough defense, held the #1-ranked LSU Tigers to a standstill before losing 7–0, leading to an LSU National Championship. The invitation to play in the first Bluebonnet Bowl in Houston in December 1959 was the eighth bowl that Howard had been a part of either as a player, assistant coach or head coach. It was the seventh bowl trip for a Clemson team and the sixth in 12 years. Howard said that Clemson's 23–7 triumph over seventh ranked Texas Christian in the Bluebonnet Bowl was the best performance he had ever witnessed by a Clemson team. Clemson was the first school to play in two bowls in the same calendar year. A Single Wing expert for 22 seasons (including nine as a line coach), Howard changed to the T-formation and its many variations in 1953. Still another major change in the offense was installed in 1965 with the "I" and pro-type set. In his 13 seasons as head coach using the single wing, Clemson won 69, lost 47 and tied 7. In 12 years of "T" teams, the Tigers won 71, lost 47 and tied 4. While using the "I" in his last five years of coaching, Clemson recorded a 25–24–1 record. Howard was named Southern Conference Coach-of-the-Year in 1948. In 1959 he was named Atlantic Coast Conference Coach-of-the-Year and was accorded the honor again in 1966. As the style of football evolved in the 1960s, Howard's ground game became outdated, and Clemson's gridiron fortunes declined. The Tigers last winning season under Howard came in 1967. On December 10, 1969, he stepped down as the fifth winningest coach in the nation, with 165 victories, 96 of them in the Atlantic Coast Conference. Howard also managed the athletic department during his tenure, and continued on as athletic director until February 4, 1971, when he was named assistant to the vice president of the university. On June 30, 1974, he retired from the university payroll, but continued to come into his office daily until failing health slowed him down, serving as Clemson's ambassador until his death in 1996. The tradition of rubbing "Howard's Rock" prior to running down the hill before home games began during Coach Howard's tenure. The playing field at Memorial Stadium was named "Frank Howard Field" in 1974 following his retirement to honor his many years of service for the university. He was inducted into the College Football Hall of Fame, the South Carolina Sports Hall of Fame, the Clemson Hall of Fame, the Clemson Ring of Honor, the Helms Athletic Hall of Fame, the State of Alabama Hall of Fame, National Football Foundation Hall of Fame, the Orange Bowl Hall of Honor, and the Gator Bowl Hall of Fame. Clemson struggled during the years following Frank Howard's retirement. His successor, Hootie Ingram, only compiled a 12–21 record. During his tenure, the tradition of running down the hill was stopped from 1970 to the end of the 1972 season, when the team decided it wanted to come down the hill for the final home game against South Carolina. The traditional "tiger paw" logo, which was designed by John Antonio of Henderson Advertising, was introduced in 1970 by Ingram and Clemson President R.C. Edwards. After a successful run as head coach of The Citadel from 1966 to 1972, Jimmy "Red" Parker coached the Tigers from 1973 to 1976, compiling a 17–25–2 record. Clemson had a 7–4 season under Parker in 1974, with Parker being named ACC Coach of the Year. The Tigers went 2–9 in 1975, and 3–6–2 in 1976. Red Parker was cut loose by the Board of Trustees at the end of the Bicentennial season. Athletic Director Bill McClellan got the task of informing Parker he was gone when Parker refused to fire his assistants. Though Parker is largely credited with building and recruiting a foundation that would ultimately set the stage for much of Clemson's success in the following seasons. Utilizing some of the talent enrolled during the Parker seasons, Charlie Pell coached the Tigers for two seasons, winning the ACC Coach of the Year award twice and leading the Tigers to the 1978 ACC Championship en route to an 18–4–1 record. Dual-threat quarterback Steve Fuller and the running back tandem of Lester Brown and Marvin Sims spearheaded a dynamic rushing attack that helped the Tigers win the ACC. The only loss came in Week 2 against SEC power Georgia, and, after a Gator Bowl win over No. 20 Ohio State, Clemson posted its second-best final AP poll finish in school history with a No. 6 ranking. In both seasons, Clemson earned berths to the Gator Bowl, although Pell left before the latter game. Pell became involved in NCAA rules and recruiting violations that came to light under the tenure of his successor, Danny Ford. Charlie Pell would leave after 1978 to become head coach at Florida, where his coaching career would end in 1984 following more NCAA rules violations. Danny Ford was promoted from offensive line coach to head coach in 1978, after Charlie Pell left for the University of Florida. He won his first game, the 1978 Gator Bowl, with a 17–15 victory over Ohio State and legendary coach Woody Hayes, who punched LB Charlie Bauman in the throat after making the game-clinching interception. In his third season, Ford guided Clemson to the summit of college football by winning the National Championship, and recording the program's fifth undefeated season. The Tigers, who were unranked in the preseason, downed three top-10 teams (Georgia, North Carolina and Nebraska) during the course of the 12–0 season that concluded with a 22–15 victory over Nebraska in the 1982 Orange Bowl. Ford, named National Coach-of-the-Year in 1981, holds the record as the youngest coach (33 years old) to win a national championship on the gridiron. The 1981 college football season was one of the craziest and most unpredictable in the history of the sport. It seemed nobody wanted to win the national championship. At several points in the season, six different teams were ranked #1 by the Associated Press. Most of them were beaten just as quickly as they earned the top spot. The Tigers slow rise to #1 quickly gained momentum with an early season 13–3 upset victory over defending national champion Georgia. The Clemson defense contained Georgia's great tailback Herschel Walker and kept him out of the end zone. Week after week, Clemson was getting better. Offensively the team was led by junior quarterback Homer Jordan, who was a dual threat as a runner and passer. It was a run-oriented offense featuring a fine tandem of tailbacks in Cliff Austin and Chuck McSwain. When they needed a big play, Jordan often threw deep to receiver Perry Tuttle, who later became a first round draft choice of the Buffalo Bills. But the true strength of the Clemson team was its defense. The Tigers had three All Americans including safety Terry Kinard, linebacker Jeff Davis and defensive end Jeff Bryant. All three went on to solid pro careers. But the most famous member of the Clemson defense was a large freshman defensive tackle named William Perry. Perry would later gain fame for his nickname "The Refrigerator" and became a football folk hero with the Chicago Bears as a lovable overweight defensive lineman who sometimes scored touchdowns while lining up at fullback. After finishing the regular season with a perfect 11–0 record, Clemson was invited to the Orange Bowl to play Big 8 champion Nebraska. To mark its first trip to the Orange Bowl in over 30 years, Clemson wore all orange uniforms for the second time. The Tigers took a quick 3–0 lead in the first quarter behind a Donald Igwebuike 41-yard field goal. But Nebraska came back with some trickery when I-back Mike Rozier threw a 25-yard option pass to Anthony Steels for a touchdown to take the lead 7–3. Leading 13–7 in the third quarter, Clemson took control for good when Homer Jordan threw a 13-yard touchdown pass to Perry Tuttle, giving the Tigers a commanding 19–7 lead. Clemson held on to win 22–15 bringing home a consensus national championship. At 34-years-old, Danny Ford became the youngest coach to lead his team to a national title. Ranked #10 before the 1982 season began, with six players entering the NFL Draft, including First Round picks DE Jeff Bryant and WR Perry Tuttle, along with Hollis Hall, Center Tony Berryhill, Brian Clark, and linebacker and former team captain Jeff Davis, there were obvious questions as to how well the team would perform in 1982 in the aftermath of a championship season. The Tigers opened the season on the road playing border rival and SEC champion Georgia, losing this time in another close game by 6 points in front of a crowd of over 82,000. The following weekend, Clemson hosted Boston College, in another fourth quarter game that resulted in a 17–17 tie. Like the previous season, the Tigers gradually improved as the season progressed. In November, Clemson's defense was resilient enough to hold of #18 Maryland and #18 North Carolina. Clemson went on to run the table the rest of the season with nine straight wins, and finish with the regular season with a record of 9–1–1. After the #8 Tigers received a bid to the Cotton Bowl with only one loss on the season, the senior class voted to decline the invitation. On November 22, 1982, the football program at Clemson was placed on probation for a 2-year period to include the 1983 and 1984 seasons. This sanction was enforced on the program by the NCAA Committee on Infractions due to a lengthy history of recruiting violations to gain an athletic advantage that had taken place from 1977 through the Tigers' 1981 National Championship season and into 1982, under the administration of two head coaches, Charlie Pell and Danny Ford. More than 150 documented violations and 69 charges were cited under NCAA bylaws in the categories of improper recruiting inducements, extra benefits to student-athletes, ethical conduct, improper financial aid, improper campus visits, improper transportation and entertainment, improper use of funds, improper employment, and improper recruiting contact. As a result of these violations, Clemson was publicly reprimanded and censured by the NCAA. 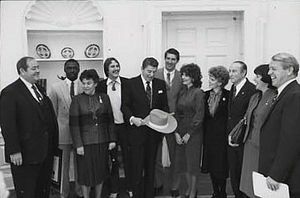 The football team was barred from participating in bowl games following the 1982 and 1983 seasons, and barred from appearing on live television in the 1983 and 1984 seasons. Also, the number of scholarships that the university could allocate to football players was restricted to 20 (from the normal limit of 30) for the 1983–84 and 1984–85 academic years. Charles Alan Wright, chairman of the NCAA Committee on Infractions said at the time, "Due to the large number and serious nature of the violations in this case, the committee believed that institutional sanctions related to appearances on television and in postseason football bowl games were appropriate. In addition, because the violations indicated a pattern of improper recruiting activities, the committee determined that a two-year limitation on financial aid to new recruits should be imposed to offset any recruiting advantage that was gained improperly by the university." The 1983 team, like the previous season, had a loss and a tie early in the season, this time with a 16–16 tie with rival #11 Georgia and a loss at Boston College. The team finished the rest of the season without a loss and going unbeaten in conference play, while finishing with another 9–1–1 season and #10, and #11 rankings. The reduction of scholarships could be felt, in the next two seasons as Clemson still remained motivated, posting a winning 7–4 season in 1984, and an even 6–6 campaign in 1985. From 1987 to 1990, Clemson posted four consecutive 10 win seasons and won three straight ACC titles, including a 35–10 victory over Penn State and a 13–6 defeat of the Oklahoma Sooners in the Florida Citrus Bowl. At that time, no team in Clemson history started higher in the AP poll than the 1988 team beginning the year as the No. 4-ranked team in the nation and a preseason favorite to win the national title. After an early upset by #10 FSU, the Tigers finished with a #9 final ranking following their bowl win over Oklahoma. The 1988 team played one of the school's toughest schedules, beating three ranked opponents and losing to two others. Rodney Williams paced the passing attack while Terry Allen rushed for 1,192 yards and 10 touchdowns for the ACC champions. In an age of offense, the '88 team was fourth in the nation in scoring defense. In 1989, Clemson registered a 10–2 season and top-12 national ranking for the fourth straight season, and ended his career at Clemson with a 27–7 win over West Virginia (and All-America quarterback Major Harris) in the 1989 Gator Bowl. Just five years after their first probation under Ford ended, Clemson once again found their football program accused of multiple recruiting violations in January 1990. The NCAA accused Clemson coaches of committing 14 rules violations, which ranged from giving cash in amounts of $50 to $150 to players to having illegal contact with recruits over a period from 1984 to 1988. Although later cleared by the NCAA of direct involvement, this chain of events led directly to the forced resignation of Clemson's popular head coach. While at Clemson, Ford also coached wins over a number of coaches later inducted into the College Football Hall of Fame, including Joe Paterno, Tom Osborne, Barry Switzer, Bobby Bowden, Vince Dooley, and Woody Hayes. Coach Ford compiled a 96–29–4 (.760) record at Clemson, 5 ACC Championships, and a 6–2 bowl record. He is tied for second on the school's wins list with Dabo Swinney and behind only Frank Howard. Ford was the third winningest coach in the country on a percentage basis after the 1989 season. Ford also coached 21 All-Americans and 41 players who went on to play in the NFL, during his 11 seasons at Clemson. After a few years away from coaching, Ford was hired by Arkansas in 1992, where he would spend five seasons guiding the Razorbacks. In 2017, Ford was named to the College Football Hall of Fame. Ken Hatfield, former coach at Air Force and Arkansas, took over as head coach at Clemson in late 1989. He had a 32–13–1 record with the Tigers and led them to three bowl games. Hatfield worked to clean up the program's image in the wake of the Ford-era sanctions. However, in the wake of Ford's success, Hatfield and many in the Clemson fanbase did not see eye-to-eye. A common saying among Tiger fans during this time was "Howard built it. Ford filled it. Hatfield killed it." This sentiment followed Clemson's first losing season (1992) since 1976. Largely due to this discontent, school officials refused to grant him a one-year extension on his contract after the 1993 season, even though the Tigers had rebounded from 5–6 in 1992 to an 8–3 record that year and were invited to the Peach Bowl. Expressing "much disappointment" in what he saw as a lack of support by Clemson fans and several university officials, Hatfield resigned at the end of the regular season. He was later hired at Rice. The purple home jerseys used by Clemson in special games made their debut during the 1991 ACC championship season, with the Tigers wearing them in the regular season against NC State and in the Citrus Bowl vs. California. Tommy West replaced Ken Hatfield at the end of the 1993 season, coaching the Tigers to a 14–13 victory in the 1993 Peach Bowl against Kentucky. West had a 31–28 record during his five seasons at Clemson and led the Tigers to three bowl games but no ACC championships. West was fired after a dismal 1998 campaign which saw Clemson go 3–8 and finish last in the ACC. West went on to be the head coach at Memphis. After Tommy West's dismissal following the 1998 season, Clemson hired Tommy Bowden, son of Bobby Bowden and coach at Tulane. Bowden led the Tigers to a 6–6 record and a Peach Bowl bid in 1999, with the team that navigated its way through a schedule that included MAC champions and undefeated Marshall, Big East champion and BCS runner-up Virginia Tech (who went undefeated during the regular season), and eventual National Champion Florida State (who finished the year undefeated). The 1999 meeting between the Tigers and Seminoles was dubbed the "Bowden Bowl" and was the first time that a father and son coached against each other in Division I football. FSU won the game 17– 14 in front of the largest crowd in the history of Death Valley. During Bowden's tenure, the Tigers were bowl eligible every season but didn't win any ACC championships (the 2004 team turned down a bowl invitation as punishment for a massive brawl during a game against the University of South Carolina). Bowden has been criticized for his teams underachieving. The 2000 Tigers started 8–0 and rose as high as #5 in the polls before losing three of their last four. The same thing happened during the 2006 season following a 7–1 start and with the team on the verge of winning the ACC Atlantic Division. The Tigers have also shown great resolve at points during Bowden's tenure. The 2003 team won four games at the end of the season to finish 9–4, which included victories over #3 Florida State and #7 Tennessee in the Chick-Fil-A Peach Bowl. The 2004 season saw the Tigers start 1–4 only to win five of their last six games (which included an overtime upset of #10 Miami), while the 2005 team overcame a 2–3 start to finish the season 9–4. 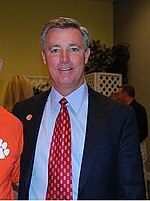 Tommy Bowden agreed to resign for $3.5 million on October 13, 2008, after leading the team to a disappointing 3–3 record (1–2 ACC) at the midpoint of a season in which the Tigers were an almost unanimous preseason pick to win their first ACC title under Bowden and were ranked #9 in the preseason polls. Assistant coach Dabo Swinney was named interim head coach. 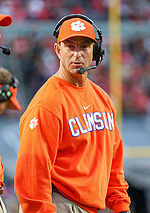 Following the departure of Tommy Bowden, wide receivers coach Dabo Swinney was dubbed interim head coach and led the Tigers to a 4–2 record, finishing the 2008 regular season at 7–6. On December 1, 2008, Swinney signed a five-year contract as Clemson's permanent head coach. On November 21, 2009, Swinney and the Tigers qualified for their first ACC title game berth, only to lose to the Georgia Tech Yellow Jackets 39–34. They were awarded a trip to the 2009 Music City Bowl, and defeated the Kentucky Wildcats 21–13, avenging their upset loss in the 2006 Music City Bowl. During the 2010 season, after a close 24–27 overtime loss to national champion Auburn on the road, Clemson was later defeated in the Meineke Car Care Bowl in Charlotte, North Carolina. In January 2011, Swinney hired new offensive coordinator Chad Morris. Morris became tied with Gus Malzahn as the highest paid assistant in college football after Clemson gave Morris a six-year contract worth $1.3 million annually. Dabo also added on running backs coach Tony Elliott, and defensive line coach Marion Hobby. On September 17, 2011, Clemson beat the defending national champions, the #21-ranked Auburn Tigers, and ended Auburn's 17-game winning streak, the longest winning streak in the nation. On October 1, 2011, Clemson became the first ACC team to beat three nationally ranked opponents in a row: #21-ranked Auburn, #11-ranked Florida State, and #11-ranked Virginia Tech. On November 12, 2011, Clemson defeated Wake Forest, winning the ACC Atlantic Division title. On November 26, 2011, Clemson lost to South Carolina for the third straight year, the first time Clemson had lost three straight to its instate rival since the seasons from 1968 to 1970. On December 3, the Tigers won their first ACC Championship since 1991, defeating Virginia Tech 38–10 in the Championship Game. #15 Clemson would go on to lose to the #23 West Virginia Mountaineers in the 2012 Orange Bowl 70–33, giving up an all-time record number of points scored in a quarter (35), half (49) and game (70) in the 109-year history of bowl games. On January 3, 2014, Clemson defeated Ohio State 40–35 in the 2014 Discover Orange Bowl at Sun Life Stadium. On December 31, 2012, Clemson achieved its first 11-win season since the national championship year with a last-second upset win over the #8 LSU Tigers in the Chick-fil-A Bowl. Clemson trailed 24–13 in the fourth quarter, but rallied back with a game-winning drive that saw a 4th and 16 conversion deep in their own territory that would lead to Chandler Catanzaro's 37-yard field goal as time expired to give Clemson a 25–24 win. The 2013 season was historic for the Clemson football program. The Tigers began the season with a 38–35 home victory over rival and fifth-ranked Georgia and ended the regular season with a record fifth-straight loss to arch-rival South Carolina, 31–17, in the first Top 10 meeting of the two schools (Clemson #4, Carolina #9). The Tigers finished 11–2 in 2013 and secured the school's first ever BCS bowl win with a 40–35 victory over #7 Ohio State in the Orange Bowl. Quarterback Tajh Boyd and wide receiver Sammy Watkins set Orange Bowl yardage records. Boyd compiled 505 total yards and threw five touchdowns. It was the Tigers fourth win over a top 10 opponent under Swinney. Clemson finished 10–3 in 2014, highlighted by a 35–17 win over arch-rival South Carolina and a 40–6 win over Oklahoma in the Russell Athletic Bowl. The Tigers took on ACC rival Florida State in week 3 of their season only to suffer a loss in overtime as #22 Clemson lost to #1 Florida State 17–23. The Tigers then claimed a six-game winning streak in the middle of their season but lost to Georgia Tech as star freshman quarterback Deshaun Watson went out with a knee injury early in the 1st quarter. The Tigers claimed the nation's number 1-ranked defense under defensive coordinator Brent Venables in 2014, and the emergence of freshman quarterback Deshaun Watson propelled the Tigers to another 10-win season for the 4th time in Dabo Swinney's six years as head coach. The 2015 season is regarded by sports writers as one of the most successful seasons in Clemson history. The Tigers possessed the nation's number 1 ranking throughout the second half of the regular season and ended with 14–1 overall record. Behind the leadership of Heisman Trophy finalist Deshaun Watson, the Tigers won the 2015 ACC Championship against number 10 North Carolina by a score of 45–37. The Tigers were selected to participate in the 2016 College Football Playoff as the top-seeded team in the tournament. Clemson defeated the #4 ranked Oklahoma Sooners in the 2015 Orange Bowl by a score of 37–17 to advance to the 2016 College Football Playoff National Championship game against the number 2-ranked Alabama Crimson Tide on January 11, 2016. Clemson lost the 2016 College Football Playoff National Championship Game to Alabama, 45–40 ending the school's 17-game winning streak. Heisman finalist quarterback Deshaun Watson had a historic performance setting the record for most total yards in national championship game history, with 478 yards (405 passing; 73 rushing) against the nation's best defense, and becoming the first player in history to amass over 4,000 yards passing and 1,000 yards rushing in a single season. 2016 Clemson Tigers football team (center, behind The President visiting the White House in 2017. In August 2016, ESPN.com reported that the 2016–2017 preseason Coaches Top 25 poll ranked Clemson Tigers football as the #2 team in the nation. With a loaded offense and plenty of young talent waiting to emerge on defense, Clemson entered 2016 as one of the frontrunners to contend for the national championship. Clemson once again won the conference and finished the regular season at 12–1. Clemson finished the season with wins at Auburn, Georgia Tech, and #12 Florida State on the road and defeated #3 Louisville in Memorial Stadium. The Tigers suffered a 43–42 home loss to Pitt in November, but benefited from losses by a couple of other playoff contenders on that Saturday and finished the season with three straight victories to rank No. 2 in the final CFP rankings. As expected from last season's returning starters, quarterback Deshaun Watson anchored an explosive offense that averaged 503 yards per game. The defense reloaded behind a standout defensive line and limited opponents to just 18.4 points a game. Clemson finished with a regular season record of 12–1, which culminated with a 56–7 win at home over arch-rival South Carolina, Swinney's largest margin of victory over the Gamecocks during his career. Clemson won the ACC championship and secured its second trip to the CFP National Championship with a 31–0 shutout of semi-finalist #3 Ohio State in the 2016 Fiesta Bowl. The Tigers competed in the College Football Playoff National Championship game in Tampa, Florida on January 9, 2017, beating the previously undefeated Alabama Crimson Tide 35–31 on a game-winning touchdown with one second remaining, and winning the 2016 National Championship. Swinney capped off a historical season in 2018 as the Tigers finished 15-0, marking the first a college team had done so since 1897. Clemson defeated #1 ranked Alabama 44-16 in the CFP National Championship. The Tigers recorded the most wins in a single season for Clemson. Freshman quarterback Trevor Lawrence threw for 347 yards and 3 touchdowns in the Tigers' rout of the Crimson Tide. The Tigers also defeated #3 Notre Dame 30-3 in the Cotton Bowl in the semi-finals of the playoff. It was Clemson's second national title in three years and the third in school history. Howard's Rock In the early 1960s, the rock was given to then head coach Frank Howard by a friend, Samuel Columbus Jones (Clemson Class of 1919). It was presented to Howard by Jones, saying "Here's a rock from Death Valley, California, to Death Valley, South Carolina." Howard didn't think anything else about the rock and it was used as a door stop in his office for several years. In September 1966, while cleaning out his office, Howard noticed the rock and told IPTAY executive director Gene Willimon, "Take this rock and throw it over the fence or out in the ditch...do something with it, but get it out of my office." Willimon had the rock placed on a pedestal at the top of the east endzone hill that the team ran down to enter the field for games. On September 24, 1966, the first time Clemson players ran by the rock, they beat conference rival Virginia, 40–35. Howard, seizing on the motivational potential of "The Rock", told his players, "Give me 110% or keep your filthy hands off of my rock." The team started rubbing the Rock for the first game of 1967, which was a 23–6 waxing of ACC foe Wake Forest. As a result, it is now a tradition for the Clemson Army ROTC to protect the Rock for the 24 hours prior to the Clemson-South Carolina game when held in Death Valley. ROTC cadets keep a steady drum cadence around the rock prior to the game, which can be heard across the campus. Part of the tradition comes after unknown parties vandalized the Rock prior to the 1992 South Carolina-Clemson game. On June 2, 2013, Howard's Rock was again vandalized when the case containing it was broken and a portion of the rock was removed by an apparent fan of the Tigers, who was eventually arrested following a police investigation. Gathering At The Paw One of the most criticized and misunderstood traditions in all of college football is Clemson's "Gathering At The Paw." After every home football game, fans are allowed to come onto the field to sing the alma mater, and gather around the center of the field. While many say it's "rushing" the field, in truth it's more of a gathering as there is a clock that tells fans when they can come onto the field. There is time given for players and coaches to get off of the field. It is done after every home game, win or lose. Running Down the Hill Probably the most highly publicized tradition of the Clemson Tigers football team is the entrance, which Brent Musburger referred to as "The Most Exciting 25 seconds in College Football." Running down "The Hill" originally started out of practicality. Before the west stands were built, the football team dressed across the street at Fike Field House and ran from there to the gate and down the hill onto the field. Now, after exiting the stadium on the west side, the players load into 2 buses which, escorted by police officers, make their way around the stadium to the east side where The Hill is located. This scene is shown on the JumboTron inside the stadium. When the buses arrive at the east side the players get out and gather at the top of the hill and stand around Howard's Rock; once most of the players are out of the buses and ready to go a cannon sounds; the band begins to play Tiger Rag and the players make their way down the hill. The spelling out of C-L-E-M-S-O-N during this Tiger Rag is one of, if not the, loudest times it will be spelled out during the game. Ring of Honor Created in 1994, the Ring of Honor is the highest award given to former coaches, players, and other individuals who made a direct impact on the football program. The Graveyard The Graveyard is a mock cemetery near the football practice fields that features tombstones commemorating Clemson's victories over ranked opponents on the road. First Friday Parade The Clemson football season kicks off each year with the annual First Friday Parade. The once a year event takes place on the Friday afternoon prior to the first home football game. Floats from various fraternities and sororities and other campus organizations are represented in the parade that rolls down main street in Clemson. The parade culminates at the Amphitheater in the middle of campus where the first Pep Rally of the year takes place. The Grand Marshal of the Parade is featured at the Pep Rally. Recent Grand Marshals have ranged from current PGA professional Dillard Pruitt, to College Football Hall of Fame legends Jess Neely and Frank Howard, to noted television announcers Brent Musburger and Ara Parseghian. Tailgating On October 15, 2012, Southern Living named Clemson the South's best tailgate. Between 1999 and 2007 the ACC Atlantic Division matchup between Clemson and Florida State was referred to as the "Bowden Bowl" to reflect the father-son head coach matchup between Bobby Bowden (Father, FSU) and Tommy Bowden (Son, Clemson). Their first meeting, in 1999, was the first time in Division I-A history that a father and a son met as opposing head coaches in a football game. Bobby Bowden won the first four matchups extending FSU's winning streak over Clemson to 11 dating back to 1992. Since 2003, Clemson is 10–6, including a 26–10 win in Clemson over then-#3 FSU. Also during this time the Tigers recorded a 27–20 win in Tallahassee in 2006 which broke a 17-year losing streak in Doak Campbell Stadium. 2007 was the last Bowden Bowl game as Tommy resigned as head coach in October 2008. #3 Clemson pulled off a thriller in Tallahassee in 2016, 37–34, over the #12-ranked Seminoles. In 2018, #2 Clemson defeated Florida State in Tallahassee 59-10, which tied the Seminoles' worst loss margin in history. This marked a 2nd time the Tigers have beaten the Seminoles by more than 17-points; FSU has defeated Clemson by more than 17-points nine times. The most lopsided contest occurred in 1993, with the FSU squad winning 57-0. As of 2018, Florida State leads the overall series 20–12. The Bulldogs and the Tigers have played each other 64 times beginning in 1897, with the 64th meeting played in 2014. Clemson's only regular-season losses of the 1978, 1982, and 1991 campaigns all came at the hands of Georgia "between the hedges", whereas Georgia's only regular-season setback during the three years of the Herschel Walker era came in Death Valley during Danny Ford's 1981 national championship run. During the two programs' simultaneous glory days of the early 1980s, no rivalry in all of college football was more important at the national level. [according to whom?] The Bulldogs and Tigers played each other every season from 1973 to 1987, with Scott Woerner's dramatic returns in 1980 and the nine turnovers forced by the Tigers in 1981 effectively settling the eventual national champion. No rivalry of that period was more competitive, as evidenced by the critical eleventh-hour field goals kicked by Kevin Butler in 1984 and by David Treadwell more than once later in the decade. Despite blowouts in 1990 by the Tigers and in 1994 and 2003 by the Bulldogs, the series typically has remained very competitive with evenly matched games. Georgia currently[when?] maintains a 41–18–4 lead in the series. The yearly conference and divisional match-up with NC State is known as the Textile Bowl for the schools' similar missions in research and development for the textile industry in the Carolinas. The first meeting of the two schools occurred in 1899. Clemson has won 16 out of 19 contest since 2000. The O'Rourke–McFadden Trophy was created in 2008 by the Boston College Gridiron Club in order to honor the tradition at both schools and to honor the legacy of Charlie O'Rourke and Banks McFadden, who played during the leather helmet era. The club plans to make this an annual presentation. Clemson first met Boston College on the football field in the 1940 Cotton Bowl Classic, the first ever bowl game for the Tigers and Eagles. Over the next 43 years, the teams met a total of 13 times. In 2005, Boston College joined the ACC and the Atlantic Division. Since then, the game has been played on an annual basis with Clemson winning in 8 of the last 9 meetings. As of 2018 the Tigers lead the series 17–9–2. These old rivals first played in 1899, but until 2010, had not faced each other in the regular season since 1971. Auburn leads the overall series 34–15–2 and had won 14 games in a row, dating back to 1952, before Clemson snapped the streak in 2011, by beating #22 ranked Auburn 38–24 in Death Valley, in front of a crowd of exactly 82,000. Along with snapping one streak, Clemson also snapped Auburn's seventeen-game winning streak coming off of the 2009–2011 seasons. The Georgia Dome hosted the Auburn-Clemson rivalry in the 2012 Chick-fil-A Kickoff Game. Clemson defeated Auburn 26–19 riding on a 231-yard performance by Andre Ellington. This game was notable due to Sammy Watkins' absence, having been suspended the first two games due to a drug-related arrest in May 2012. #3 Clemson again defeated #13 Auburn in 2017 14-6 in Clemson. The two southern schools have long, decorated histories in the sport of college football. They first met on the football field on November 29, 1900. 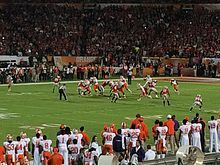 Clemson won the inaugural matchup by a score of 35–0. The Crimson Tide and Tigers met again in 1904 and 1905, with Clemson winning both games. Beginning with the next meeting between the two squads in 1909, Alabama won the next thirteen matchups against Clemson. The Tide posted the biggest margin of victory in the rivalry in 1931, whopping the Tigers by a margin of 74–7. In the first seven games of Alabama's 13-game streak, Clemson only score seven total points and was shut out in six of the seven games. After a 56–0 shutout Alabama victory in 1975, the squads didn't meet again until 2008, when they squared off on opening weekend in Atlanta, Georgia. The Tide emerged victorious with a 34–10 victory. The last four matchups between the squads have had national championship implications and have greatly intensified the rivalry. The teams squared off in the 2016 College Football Playoff National Championship in Glendale, Arizona, with Alabama emerging with a thrilling 45-40 victory. The next year, the teams again found themselves doing battle in the 2017 College Football Playoff National Championship in Tampa, Florida, with Clemson emerging with a thrilling 35-31 victory and their first win over the Crimson Tide since 1905. Once again the teams did battle in the 2018 Sugar Bowl in New Orleans, Louisiana with a trip to the 2018 College Football Playoff National Championship game on the line. Alabama won the contest by a score of 24–6. The two teams once again met for the title in the 2019 College Football Playoff National Championship. This time, Clemson prevailed with a 44-16 rout of the #1-ranked Crimson Tide to win its third national title. Clemson finished their undefeated 1981 season with a 22–15 victory over the #4 Nebraska Cornhuskers in the 1982 Orange Bowl, and were named the national champions by all major selectors. Clemson was selected as the one seed in the second College Football Playoff and defeated the fourth seed Oklahoma on December 31, 2015 in the 2015 Orange Bowl. They lost to the Alabama Crimson Tide in the championship game on January 11, 2016. Clemson was selected to the third College Football Playoff as the second seed and defeated the third seed Ohio State on December 31, 2016 in the 2016 PlayStation Fiesta Bowl. The Tigers defeated the Alabama Crimson Tide in the national championship game on January 9, 2017. Since its beginnings in 1896, Clemson has completed six undefeated seasons. [not in citation given] This includes four perfect seasons in which the Tigers were undefeated and untied. In 1965, South Carolina violated participation rules relating to two ineligible players and was required to forfeit wins against North Carolina State and Clemson. North Carolina State and Clemson were then declared co-champions. In 2005, the Atlantic Coast Conference divided into two divisions of six teams each and began holding an ACC Championship Game at the conclusion of the regular football season to determine the ACC Football Champions. Clemson won its first outright ACC Atlantic Division championship in 2009 and again in 2011. In 2012, Clemson tied for a share of the Atlantic Division Championship and was named co-champion of the division. † On August 18, 2011, Georgia Tech vacated their victory due to NCAA violations and the game is considered by the NCAA and ACC to have no winner. ‡ Clemson finished 7–1 in the ACC and was named co-champion of the Atlantic Division per ACC rules. Florida State played in the ACC Championship by owning the tie-breaker advantage. ^ Clemson finished 7–1 in the ACC and was named co-champion of the Atlantic Division per ACC rules. Clemson played in the ACC Championship by owning the tie-breaker advantage. Clemson has ended their football season ranked 32 times in either the AP or Coaches Poll. [not in citation given] Clemson currently[when?] has eight consecutive 10 win seasons. It is the 2nd longest active streak behind Alabama with eleven. This is a list of Clemson's ten most recent bowl games. In 1951, the College Football Hall of Fame opened in South Bend, Indiana. Clemson has had 3 players and 4 former coaches inducted into the Hall of Fame. + Steve Fuller's number 4 was retired in 1979. However, it was brought out of retirement in 2014 to be worn by quarterback Deshaun Watson. The NCAA recognizes All-Americans selected by the Associated Press (AP), American Football Coaches Association (AFCA), Football Writers Association of America (FWAA), The Sporting News (TSN), and the Walter Camp Football Foundation (WCFF) to determine if a player is regarded as a Consensus or Unanimous All-American. To be selected a Consensus All-American, a player must be chosen to the first team on at least three of the five official selectors as recognized by the NCAA. If a player is named an All-American by all five organizations, he is recognized as a Unanimous All-America. Clemson players have been honored 28 times as Consensus All-Americans, and 5 times as Unanimous All-Americas. + Denotes that the player was a Unanimous All-American as they were listed on the first team of every official selector. Isaiah Battle – Offensive tackle, Carolina Panthers No. Wayne Gallman – Running back, New York Giants No. ^ "Clemson crashing the party of elite football schools". Daily News. January 5, 2017. Retrieved January 7, 2019. ^ Tracy, Marc (December 29, 2018). "Clemson Crushes Notre Dame to Reach Its 3rd National Title Game in 4 Seasons". The New York Times. ISSN 0362-4331. Retrieved January 7, 2019. ^ "2015 Clemson Football Media Guide" (PDF). Clemson University. 2015. p. 51. Retrieved October 28, 2015. ^ "2011 Clemson Media Guide & Supplement". Clemson Sports Information. 2011. pp. 182–188, 190–194. Archived from the original on May 3, 2012. Retrieved July 22, 2011. ^ Bird, Michael (January 4, 2019). "Bama-Clemson is among America's best sports duopolies ever". SBNation.com. Retrieved January 7, 2019. ^ Gilliland, Zach. "Clemson Routs OU in Russell Athletic Bowl". Retrieved January 11, 2017. ^ a b Stanton, Russ. "Would Clemson be Obsolete Without Auburn?". Retrieved January 11, 2017. ^ "Clemson Yearly Results-1896". Cfbdatawarehouse.com. Retrieved October 10, 2018. ^ "Page Not Found – Clemson University, South Carolina" (PDF). Retrieved January 11, 2017. ^ "Clemson Coaching Records-John Heisman". Cfbdatawarehouse.com. Retrieved October 10, 2018. ^ "Southern Intercollegiate Athletic Association Conference Champions". Cfbdatawarehouse.com. Retrieved October 10, 2018. ^ "John Heisman". CBSSports.com COLLEGE NETWORK. Archived from the original on December 10, 2010. Retrieved September 17, 2011. ^ Nauright, John. "The South Carolina – Clemson Football War of 1902". Retrieved January 11, 2017. ^ Haney, Travis; Williams, Larry (January 1, 2011). "Classic Clashes of the Carolina-Clemson Football Rivalry: A State of Disunion". History Press. Retrieved January 11, 2017 – via Google Books. ^ "Tech Slaughtered By Clemson Tigers". Atlanta Constitution. October 18, 1903. p. 7. Retrieved March 10, 2015 – via Newspapers.com. ^ Lou Sahadi. "24. 1903 Game With Cumberland". 100 Things Clemson Fans Should Know & Do Before They Die. ^ "Clemson-South Carolina: A game-by-game history". Retrieved January 11, 2017. ^ "From Tigers to Wildcats". ^ "No. 19 Tigers Run Past Tar Heels, 52–7". Archived from the original on June 30, 2016. Retrieved May 24, 2016. ^ "Tiger Timeline". Archived from the original on June 4, 2016. Retrieved May 24, 2016. ^ "Red Sanders" (PDF). Archived from the original (PDF) on March 4, 2016. ^ "One-Man Defensive Stand". ClemsonTigers.com. ^ "Frank Howard". Retrieved August 23, 2016. ^ Litsky, Frank (January 27, 1996). "Frank Howard, 86, the Coach Of Top Clemson Football Teams". The New York Times. ISSN 0362-4331. Retrieved August 23, 2016. ^ "Gift from Death Valley became "Death Valley" tradition". Mark Schlabach. Retrieved September 17, 2011. ^ "Red Parker returns to The Citadel". Ken Burger/ The Post and Courier. Retrieved September 17, 2011. ^ "Former Citadel, Clemson coach Red Parker dies at 84". January 4, 2016. Retrieved August 23, 2016. ^ "Woody Hayes' punch still resounds 35 years later". The San Diego Union-Tribune. Retrieved January 10, 2019. ^ Sumner, Jim. Looking Back... A Walk Through Clemson's 1981 National Championship Season Archived October 22, 2007, at the Wayback Machine. TheACC.com, October 10, 2006. ^ Miamisouthpaw (August 24, 2009). "South Florida Sports Paradise: Ghosts of the Orange Bowl: 1981 Clemson Tigers". South Florida Sports Paradise. Retrieved August 23, 2016. ^ "1981 national championship "put Clemson on the map"". Archived from the original on August 26, 2016. Retrieved August 23, 2016. ^ "Clemson football: Tigers were overlooked at No. 1 in 1981 too". December 26, 2015. Retrieved August 23, 2016. ^ "NFL.com Draft 2016 – NFL Draft History: Full Draft Year". NFL.com. Retrieved August 23, 2016. ^ "1982 Clemson Tigers". College Football at Sports-Reference.com. Retrieved August 23, 2016. ^ "SEVERE SANCTIONS LEVIED ON CLEMSON". The New York Times. November 23, 1982. Retrieved January 11, 2017. ^ "List of Charges Made Against Clemson by NCAA". November 24, 1982. Retrieved January 11, 2017 – via washingtonpost.com. ^ a b Asher, Mark (November 23, 1982). "Clemson: 2 Years NCAA Probation, 20 Scholarships Cut". Retrieved January 11, 2017 – via washingtonpost.com. ^ "2008 Clemson Football Media Guide" (PDF). Clemson University. 2008. ^ "Clemson Reveals It Is Under Inquiry by N.C.A.A." The New York Times. Associated Press. January 10, 1990. Retrieved January 21, 2008. ^ a b "How Danny Ford went from Clemson legend to out of college football". ^ "Clemson Drops Ford With $1 Million Deal". The New York Times. Associated Press. January 19, 1990. Retrieved January 21, 2008. ^ "Danny Ford selected to College Football Hall of Fame". ^ Hanley, Brian. Clemson gets "Real McCoy". Chicago Sun-Times, December 30, 1990. ^ Clemson coach quits. The New York Times, November 25, 1993. ^ "HISTORY OF BOWDEN BOWL". MSN TV. Archived from the original on July 7, 2012. Retrieved September 17, 2011. ^ Hunter Knowles, Bowden Bows Out, The Tiger News, October 17, 2008. ^ "Georgia Tech stripped of 2009 ACC title win due to NCAA violations". USATODAY.COM. Retrieved January 6, 2017. ^ "Kentucky vs. Clemson – Game Recap – December 27, 2009 – ESPN". ESPN.com. Retrieved January 6, 2017. ^ "Clemson vs. Auburn – Game Recap – September 18, 2010 – ESPN". ESPN.com. Retrieved January 6, 2017. ^ "Clemson's Chad Morris leaps from preps to $1.3 million". USA TODAY. Retrieved January 6, 2017. ^ Kirk, Jason. "Auburn Vs. Clemson Final Score: AU's 17-game Winning Streak Ended, 38–24". SBNation.com. Retrieved January 6, 2017. ^ "Clemson vs. Virginia Tech – Game Recap – October 1, 2011 – ESPN". ESPN.com. Retrieved January 6, 2017. ^ "Wake Forest vs. Clemson – Game Recap – November 12, 2011 – ESPN". ESPN.com. Retrieved January 6, 2017. ^ "Clemson vs. South Carolina – Game Recap – November 26, 2011 – ESPN". Retrieved January 11, 2017. ^ "Virginia Tech vs. Clemson – Game Recap – December 3, 2011 – ESPN". ESPN.com. Retrieved January 5, 2017. ^ "West Virginia Mountaineers vs Clemson Tigers – Recap". ESPN. ^ Kirk, Jason. "Tigers win Chick-fil-A! (The Clemson ones)". SBNation.com. Retrieved January 5, 2017. ^ "Georgia vs. Clemson – Game Recap – August 31, 2013 – ESPN". ESPN.com. Retrieved January 6, 2017. ^ "South Carolina makes it five in a row against Clemson". Retrieved January 11, 2017. ^ "Clemson Football – Tigers News, Scores, Videos – College Football". ESPN. ^ "Clemson vs. Florida State – Game Recap – September 20, 2014 – ESPN". ESPN.com. Retrieved January 5, 2017. ^ Brenner, Aaron. "Watson goes home, revisits site of 2014 knee injury". Post and Courier. Retrieved January 6, 2017. ^ "Venables Named Defensive Coordinator-of-the-Year". ClemsonTigers.com. ^ "Clemson football: Tigers were overlooked at No. 1 in 1981 too". NCAA.com. December 26, 2015. Retrieved January 5, 2017. ^ "North Carolina vs. Clemson – Game Summary – December 5, 2015 – ESPN". ESPN.com. Retrieved January 5, 2017. ^ "The Clemson Tigers Win the 2015 College Football Playoff Semifinal at the Capital One Orange Bowl – General News – News | Orange Bowl". game.orangebowl.org. Retrieved January 5, 2017. ^ Hutchins, Andy. "How Deshaun Watson became a superstar". SBNation.com. Retrieved January 5, 2017. ^ Rittenberg, Adam. "Alabama Crimson Tide, Clemson Tigers top preseason Amway Coaches Top 25 poll". ESPN.com. Retrieved August 4, 2016. ^ "CFB Preview 2016 Clemson Tigers". ESPN.com. Retrieved January 5, 2017. ^ "Louisville Cardinals vs. Clemson Tigers – October 1, 2016 Gametracker". CBSSports.com. Retrieved January 6, 2017. ^ Moriarty, Morgan. "Clemson beats Virginia Tech to win the ACC and punch its ticket to the Playoff". SBNation.com. Retrieved January 2, 2017. ^ "Clemson fans unhappy that head ref for Pitt game is a USC grad". thestate. Retrieved January 2, 2017. ^ "Turnovers, officiating doom No. 2 Clemson in loss to Pittsburgh". Retrieved January 7, 2017. ^ "2016 FBS (I-A) College Football Team Statistics Leaders for Total – ESPN". ESPN.com. Retrieved January 6, 2017. ^ "Fiesta Bowl Preview and Prediction: Clemson vs. Ohio State". AthlonSports.com. Retrieved January 5, 2017. ^ "South Carolina vs. Clemson – Game Recap – November 26, 2016 – ESPN". ESPN.com. Retrieved January 6, 2017. ^ Crouse, Karen (December 31, 2016). "Clemson Pounds Ohio State to Set Up a Rematch With Alabama". The New York Times. ISSN 0362-4331. Retrieved January 2, 2017. ^ "College football champions: Every undefeated team to win the national championship since 1936". NCAA.com. Retrieved January 10, 2019. ^ "2016 Clemson Football Coaches". Clemson University Athletics. ^ "Clemson hires 10th assistant coach". 247 Sports. ^ Clemson Alumni Association, "Clemson Alumni: Today 2008," Harris Connect, Inc., Chesapeake, Virginia, 2007, no ISBN, page 1904. ^ a b c Howard, Frank, with Bradley, Bob, and Parker, Virgil, "Howard," Howard, Lincoln, Nebraska, 1990, ISBN 0-934904-22-7, page 132. ^ a b Bradley, Bob, "Death Valley Days," Longstreet Press, Inc., Atlanta, Georgia, 1991, Library of Congress card number 91-061931, ISBN 1-56352-006-0, page 17. ^ Clemson Athletic Department, "2001 Clemson Football," Keys Printing, Greenville, South Carolina, 2001, no ISBN, page 340. ^ "TigerNet – Football – Traditions – Running Down the Hill". thetigernet.com. ^ "Herald-Journal – Google News Archive Search". news.google.com. Retrieved January 17, 2017. ^ "Clemson arrests, charges man in connection to Howard's Rock vandalism". ESPN. ^ "Gathering At The Paw: A Clemson Tradition". ^ "Traditions | About | Clemson University, South Carolina". clemson.edu. Retrieved January 17, 2017. ^ "Clemson video gives a great look at what its unique pregame experience is like". Retrieved January 17, 2017. ^ "Clemson Wins The South's Best Tailgate". southernliving.com. October 15, 2012. Retrieved November 18, 2012. ^ "2018 Media Guide" (PDF). clemsontigers.com. Clemson Athletics. ^ "Clemson-Alabama playoff rivalry continues in Sugar Bowl". FOX Sports. December 3, 2017. Retrieved January 10, 2019. ^ "Alabama vs. Clemson: A Football History". Ussporthistory.com. January 11, 2016. Retrieved January 10, 2019. ^ Matt Brown (January 8, 2016). "Clemson seeks its first win vs. Alabama since 1905". Sports on Earth. Retrieved January 10, 2019. ^ a b c Kirk, Jason (January 9, 2017). "Clemson's lost 13 straight to Bama since 1905. The last 2 are what brought us here". SBNation.com. Retrieved January 10, 2019. ^ "Interesting facts about Clemson and Alabama you should know before the big game". Charlestondaily.net. January 1, 2018. Retrieved January 10, 2019. ^ "COLLEGE FOOTBALL; Florida State Leaves Clemson in Awe". The New York Times. September 12, 1993. Retrieved January 10, 2019. ^ "Alabama To Play Clemson In Season Opener At Georgia Dome". Cstv.com. January 4, 2008. Retrieved January 10, 2019. ^ Final (August 31, 2008). "Alabama vs. Clemson - Game Recap - August 30, 2008". ESPN. Retrieved January 10, 2019. ^ Final (January 12, 2016). "Alabama vs. Clemson - Game Recap - January 11, 2016". ESPN. Retrieved January 10, 2019. ^ "Clemson vs. Alabama - Game Recap - January 9, 2017". ESPN. January 10, 2017. Retrieved January 10, 2019. ^ "Alabama suffocates Clemson in dominant Sugar Bowl victory". USA Today. January 2, 2018. Retrieved January 10, 2019. ^ "Alabama vs. Clemson - Game Recap - January 1, 2018". ESPN. January 2, 2018. Retrieved January 10, 2019. ^ Papanek, John (January 11, 1982). "Year of the Tigers". Sports Illustrated. Retrieved September 6, 2011. ^ "Past Division I Football Bowl Subdivision (Division I FBS) National Champions". NCAA. Archived from the original on June 11, 2011. Retrieved September 7, 2011. ^ "Clemson Yearly Totals". College Football Data Warehouse. Archived from the original on April 21, 2015. Retrieved September 5, 2011. ^ "2014 Clemson Football Media Guide" (PDF). Clemson University. 2014. p. 66. Retrieved May 16, 2015. ^ "ACC Champions" (PDF). 2007 Atlantic Coast Conference Media Guide (PDF). Atlantic Coast Conference: Page 93. 2007. Retrieved September 5, 2011. ^ Alex Riley (October 11, 2009). "USC football's lost title team of 1965". The State. Retrieved September 5, 2011. ^ ESPN.com (July 18, 2011). "NCAA places Georgia Tech on probation". ESPN.com. Retrieved September 5, 2011. ^ "Furman vs. Clemson - Game Summary - September 1, 2018". ESPN. January 9, 2018. Retrieved January 10, 2019. ^ "Clemson in the Polls". College Football Data Warehouse. Archived from the original on April 21, 2015. Retrieved September 6, 2011. ^ Gilliland, Zach. "Clemson Routs OU in Russell Athletic Bowl". Bleacher Report. Retrieved January 13, 2017. ^ "Hall of Fame: Select group by school". College Football Hall of Fame. Football Foundation. Retrieved September 6, 2011. ^ "2017 Hall of Fame Class: Danny Ford". Cfbhall.com. December 4, 1978. Retrieved January 10, 2019. ^ "Steve Fuller, Deshaun Watson and the legacy of No. 4". Greenvilleonline.com. January 8, 2017. Retrieved January 10, 2019. ^ rewBoardwine (July 25, 2016). "Clemson Football: Tavien Feaster gets C.J. Spiller's number". Retrieved January 11, 2017. ^ "College football CONSENSUS ALL AMERICANS rankings". Winsipedia. Retrieved January 10, 2019. ^ Moriarty, Morgan (December 13, 2018). "A composite 2018 All-America team, led by Bama, Clemson, and LSU". SBNation.com. Retrieved January 7, 2019. ^ "ACC 50th Anniversary Football Team Announced". theacc.com. July 23, 2002. Archived from the original on March 22, 2012. Retrieved September 6, 2011. ^ "Clemson Tigers football all-time record, wins, and statistics". Winsipedia. Retrieved January 10, 2019. ^ "Clemson Tigers Football Schedules and Future Schedules". fbschedules.com. Retrieved April 1, 2019. ^ "Rivals.com 2018 recruiting team rankings". Rivals.com. Retrieved December 22, 2017. Bob Bradley; Sam Blackman; Chuck Kriese (1999). Clemson: Where the Tigers Play – The History of Clemson University Athletics. Sports Publishing. ISBN 1-58261-369-9.